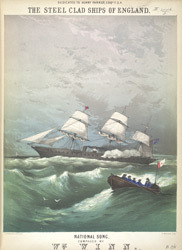 This music sheet cover illustration shows a ship in full sail and a lifeboat bearing the name 'Warrior'. HMS Warrior was a very important ship transforming concepts of warfare; she was the principle navy sailing boat and was the first ship to have steam power. Warrior was revolutionary as she could be driven by both steam and sail. HMS Warrior would have been immediately recognisable to Music Hall audiences who would have seen her as a symbol of their countries naval power.